Eagles have long been the symbol of achievement and flying high. 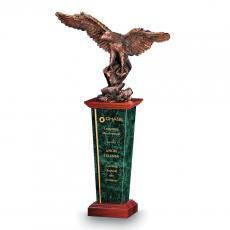 Eagle trophies are an excellent choice for a winning team, the leader of a successful project or a salesperson who has met or exceeded her quota. They are often used for safety and for any military-related recognition awards. 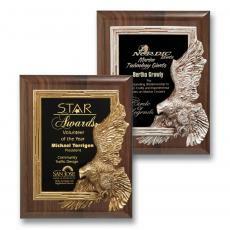 Personalized eagle awards come in a wide range of styles, materials and sizes. Wood is a popular choice, often as a cutout on a plaque. 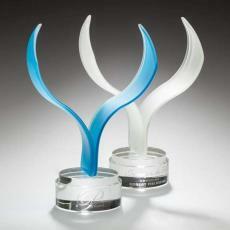 Or choose a bronze-colored resin statue on a base with a contrasting color. 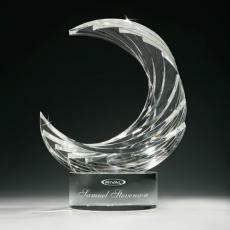 Acrylic awards can have the head of an eagle etched on a column or plaque. Crystal eagle sculptures are highly esteemed by recipients. Often a crystal sculpture of the head of an eagle is used on the top of a wood base. To customize it and make it an engraved eagle award, the name of the person receiving it and the reason for the honor can be laser engraved somewhere on the trophy. Individualizing it this way gives it more meaning. Each time the recipient looks at it in years to come, he will remember with fondness and pride the people who gave it to him. $135 - $155| Sizes: 7.75"
$135 - $155| Sizes: 8"
$275 - $295| Sizes: 12" & 4"x12"
$215 - $240| Sizes: 2.375"x6" & 2.375"x7"
$245 - $265| Sizes: 4"x7.5" & 7.5"
$135 - $155| Sizes: 3.5"x6.75" & 8.375"
$165 - $180| Sizes: 10.75"
$165 - $180| Sizes: 10"
$240 - $380| Sizes: 10.75" & 14.5"